Liar Loan - What Does It Mean? What is a "liar loan"? 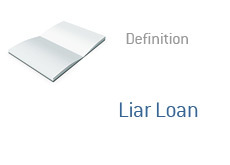 What is the definition of a "liar loan"? "Liar loans" became extremely popular during the 2001-06 real estate boom in the United States. Certain mortgages required little or no documentation in order to be approved, and instead relied on credit scores, repayment history for previous mortgages, etc. Many abused these low documentation and no documentation mortgages during the real estate boom. People lied about their incomes and assets in order to be approved for bigger mortgages, while many mortgage brokers and loan officers looked the other way in order to gain another commission. As long as the real estate market remained hot, everyone won. Many people who took out "liar loans" were simply looking to flip their properties anyways, and if the market continued to trend higher, they would bank a nice profit on their transaction. Of course, when the real estate market started to crash, people in these "liar loans" had dramatically overstated their incomes, meaning that they really couldn't afford their mortgages in the first place. Everyone likes to people fingers when it comes to "liar loans" - people who overstated their incomes contend that the mortgage broker or loan officer should have verified their claims, while mortgage brokers and loan officers maintain that it is up to the loan applicant to tell the truth on their mortgage applications. It seems quite ridiculous that people were approved for $500k+ mortgages without having to verify their incomes and/or assets, but what do I know?